Cactus (Paris) xiv. No. 63, 137 (1959). Habit at Carrizal Bajo, 03 Atacama, Chile. 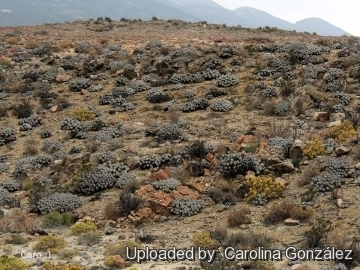 Origin and Habitat: Copiapoa dealbata occurs along the Chilean coast, both north and south of Carrizal Bajo, and at a point ca halfway towards Totoral, Atacama, Chile. It has a restricted range (extent of occurrence 500 km2), however the species is abundant, there is no continuing decline of the populations. Altitude: (0–)20-500(-700) metres above sea level. Habitat: The species is locally abundant forming groups of several individuals near the coast, in coastal hills (lomas costeras) in a very dry area on sandy alluvial and rocky soils, and desert shrubland on sandy soil. Despite the lack of rain where it lives, the extreme aridity is attenuated by the frequent, often dense, coastal fogs. It shows a recurrent pattern; usually it is overcast in the early mornings, the clouds dissipating during the late morning and returning during the late afternoons. At times this region is dominated by geophytes, which can cover expanses of the desert spectacularly. The species is sporadically collected for ornamental use, only a small portion of the plant is taken and this is not lethal. The major threats are off-road vehicles and road construction. 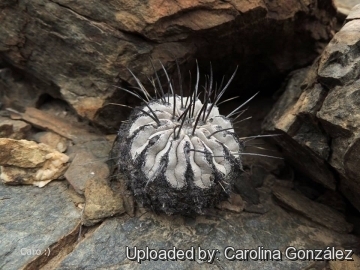 Description: Copiapoa dealbata is a cespitose, greyish-white globular cactus, similar to Copiapoa cinerea but usually with longer spines. 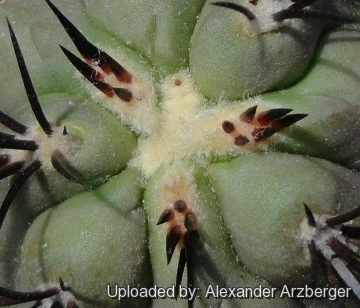 Typically Copiapoa dealbata has only one single spine from the areoles. 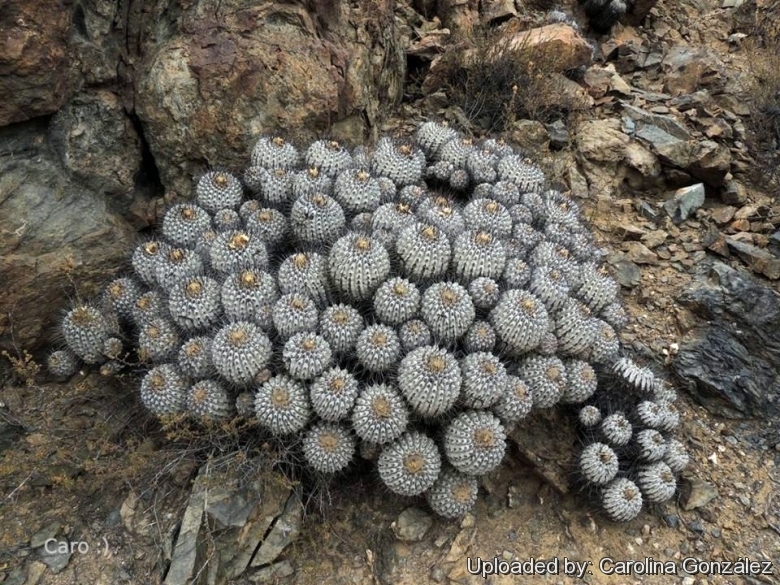 The form with more spine per arela (up to 7) is known as Copiapoa carrizalensens but the two forms grows side by side and plants with few or more spines grows together in the same population. Habit: Plants strongly branched basally, forming imposing mounds up to 1 m tall and more than 2 m wide. 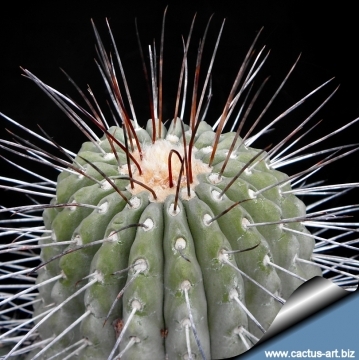 Spines: Copiapoa dealbata has mostly 1 single spine, 2–5 cm long (sometimes 1–3 smaller) straight, stiff, needle-like, black to light brown, becoming greyish white with time. Younger specimens usually have more numerous spines per areloa. 10) Faundez, L., Walter, H.E. & Saldivia, P. 2013. 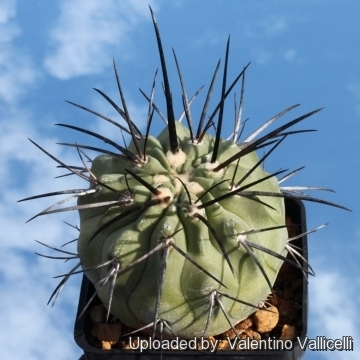 Copiapoa dealbata. The IUCN Red List of Threatened Species 2013: e.T152929A696219. http://dx.doi.org/10.2305/IUCN.UK.2013-1.RLTS.T152929A696219.en. Downloaded on 18 February 2016.